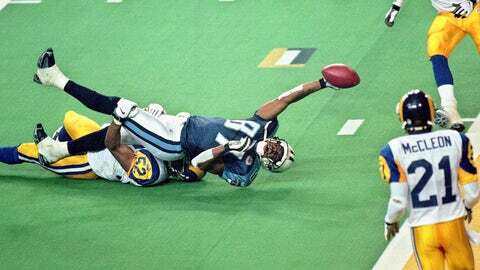 Mike Jones didn’t realize what he had done when he pulled down Titans receiver Kevin Dyson at the 1-yard line as time expired in Super Bowl XXXIV. Sure, the linebacker was happy that he and his Rams teammates and coaches had just won a championship with a 23-16 victory, but he didn’t know what his play had meant to the football world. It wasn’t until he was taking off his pads in the locker room, when someone broke the news to him. "Peter King comes up to me and said ‘you know, that might be one of the best plays in Super Bowl history," Jones said to Mike Hill on My Big Game Moment. In fact, that play is known simply as "The Tackle." Not bad for an undrafted linebacker out of Missouri, right? What’s funny about Jones’ legendary takedown is how close to it came to not being so. The Titans had the ball at the 10-yard line with just six seconds remaining. A touchdown and an extra point here would have sent the game into overtime. Jones was lined up over tight end Frank Wychek, but before the snap, he turned his head to listen to the coverage call from the deep safety. When Jones turned around, he saw that the Titans had an uncovered receiver. What if Tennessee had just snapped the ball right then? "We might have been in trouble," Jones said. However, the Titans took their time, sending a man in motion and allowing the Rams to get someone on the uncovered receiver. And while Jones was lined up over Wychek, he had his eye on Kevin Dyson the entire time. The rest is history. It was a fitting end to one of the most electrifying fourth quarters in Super Bowl history. "It was exciting, it was draining, it was everything you get in a football game." You can watch all of Mike Jones’ My Big Game Moment above.